It’s been a rough ride: literally. After losing my FEI horse several years ago, and then my favorite mare to colic two years ago, I wasn’t sure I’d ever find the right equine partner again. Although I currently have three horses, the one who shows up in all the Piaffe Girl photos is my eldest — a five year old Holsteiner (Lesanto x Montgomery) that I stumbled across on Craigslist in 2010. Although he can be difficult, complicated, spooky, studdish . . . blah.blah.blah . . . he quickly became my “heart horse.” As such, his quirks that annoy (and even frighten) others don’t really bother me all that much. I’ve come to terms with the fact that he will most likely always hate trees, birds, and dogs — and thus spook at them. Every single day. But that’s okay, because once I accepted him for what he is we reached a sort of agreement: he can spook in place, and he can’t run away. For us, it works. Things had been progressing rather swimmingly in his training until about eight weeks ago when a horrible vaccine reaction left him feverish, convulsing, and in shock. For nearly two days straight I sat in (and later in front of) Deuce’s stall cradling his head, praying, crying, and begging the powers-that-be to just let him be okay. I didn’t care if he became a trail horse, I just wanted him healthy and whole again. The Almighty must’ve heard me because on the third day Deuce threw his head straight up in the air, gave a loud dragon-like snort, and came back to us. He started nibbling grass, drinking, and seemed brighter. After two weeks of hand-walking, Rood & Riddle gave the go-ahead for light riding. Although I knew we couldn’t pick up where we’d left off, I was surprised when my normally forward horse refused to move under saddle. The vet checked his back, which was unusually sore, so we did Banamine, massage, several chiropractic sessions. Nothing worked. The saddle (which had been custom fitted) checked out. He had a clean bill of health — but the behaviour got worse. I went from relishing the daily progress of my young FEI prospect to worrying whether I could even get him to walk without a meltdown. Since there wasn’t anything physically wrong, I started to feel I was the problem, and that we just weren’t as good a fit as I imagined, so began thinking about sending him away for another trainer to ride and then sell. However, I just couldn’t get over the nagging feeling that there was, despite professional advice to the contrary, a saddle fit issue — not in the gullet or tree, but over the withers. So I gave the boy another two weeks off, purchased a used Wintec Isabell off eBay, and crossed my fingers. Yesterday, new saddle in hand, I trekked out to the barn for a test ride. After some serious airs above ground on the longe, I took Deuce into the round pen, and quickly hopped up. For a brief moment I could feel him start to rear . . . and then he stopped. He took a tentative step forward, and then another, and another — and soon we were gently walking around the pen. I asked for a few trot strides, and again he thought about resisting, but relaxed and moved. Needless to say lots of peppermints and patting followed! 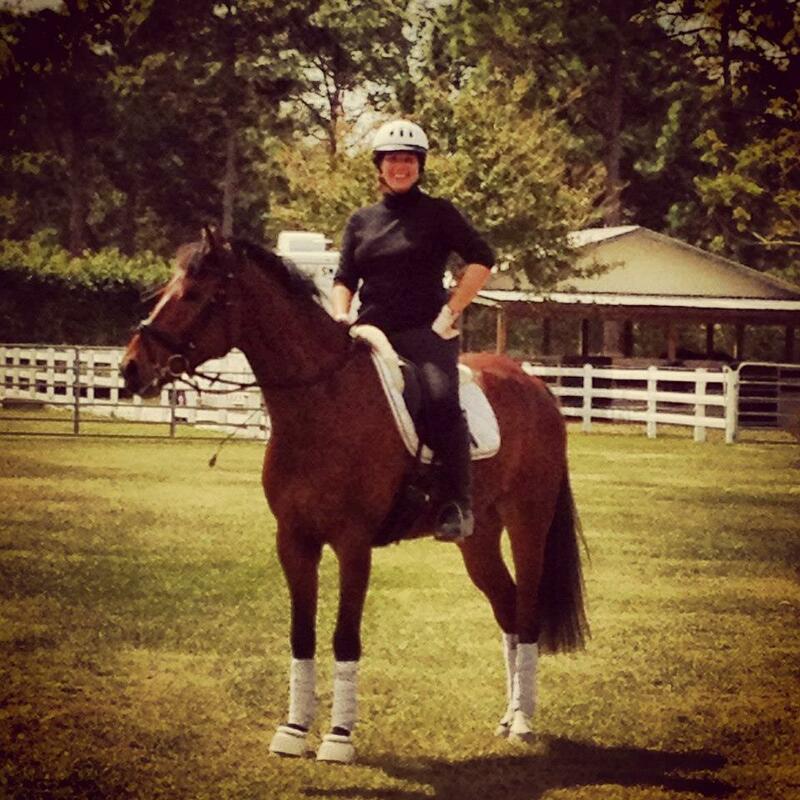 Today, I took him into the main dressage arena and after an excellent warm-up on the longe, rode without issue. In fact, my lovely swinging horse of two months ago was back, and happy to work. Although I greatly respect all the professionals that keep my team running, I’m glad I listened to my gut on this one and didn’t give up. Sometimes you just need a little luck and a lot of faith. Previous Post On fashion and common sense. Next Post Roeckl Gloves: Truly Suprema? What a harrowing story…here’s hoping he continues to come back to full power spooking and all. Thanks, Karen 🙂 He’s slowly getting his spook back, lol. Thank you so much! It’s great getting feedback on the blog; sometimes I feel like I’m talking into the abyss 🙂 The Boy is doing well. Thank you so much for following: new stuff to come soon.